Join The D—-spin Pants Party Pool! 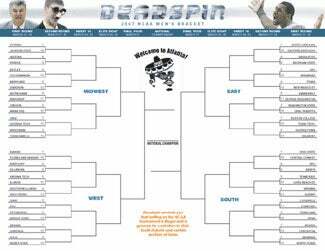 All right, it wouldn't be the NCAA tournament if we weren't overkilling the entire thing with endless previews, discussions, tidbits and, of course ... our yearly tournament pool. We would have had this up much earlier for you, but something strange kept happening: Every time we tried to save the name of our group — "Deadspin Pants Party" — to ESPN's Tournament Challenge, like we do every eyar, it told us there was an error and that we needed to try again. So we did it again. And again. This went on for about an hour. We asked some friends to try to set up the league under their logins; nothing worked. Because we're just exhausted enough today to be a little nutty, we, on a whim, named our league "D—-spin Pants Party." And it worked! We hope we're just imagining this and that we're not a banned word on the site, along with "gay" and "TJ Simers." We encourage you to try to load a league with Deadspin in the title, and you can let us know if it's just us. We hope so.